Over 1,000 hospitals and health systems rely on DataCore software-defined storage to simplify management, reduce costs, and provide high-performance storage systems with zero downtime. 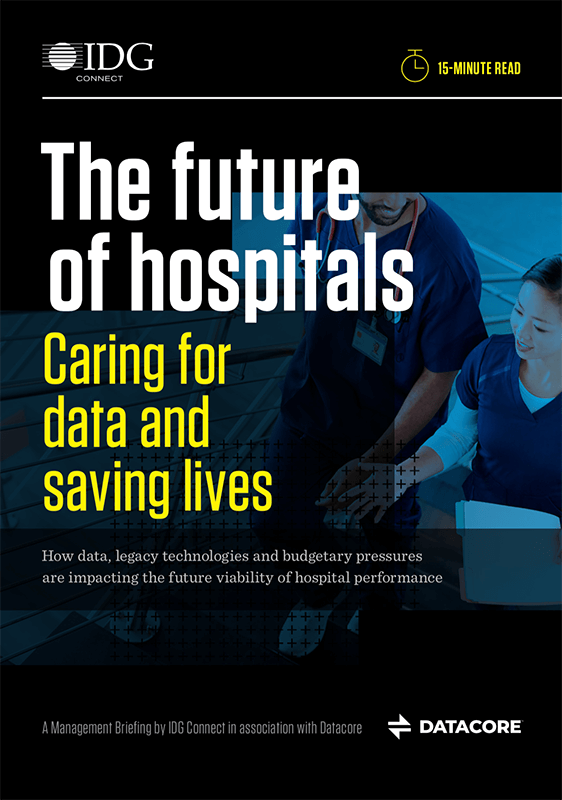 Hospitals and health systems are benefitting from an explosion of information technologies to help run their facilities, improve patient care and keep costs contained. And with this influx of data comes an enormous responsibility for hospital IT teams to manage the rapidly growing pool of healthcare information so that it is secure and compliant, is always accessible, and isn’t compromised. We have looked at a lot of different technologies. The capabilities of DataCore’s software-defined storage offering not only align with our uncompromising standards but allow us to continue to deliver patient care seamlessly without interruption, which is critical to our mission. Because we are a small IT staff, we wear a lot of hats—and we get pulled in a lot of directions. As a result, DataCore’s simplicity of management and ease-of-use is just as important to us as its cost-effectiveness and overall performance. When our team is called on to handle IT for multiple facilities, we can put whatever systems the newly acquired hospitals have under our existing infrastructure—because we have a software-defined infrastructure that will support this growth. High availability was the first and foremost reason for going with DataCore—and for continuing with it. Now, everything that is mission-critical to the running of the hospital is supported by the DataCore software-defined storage platform. Users not only receive faster access to data, but they benefit from more server capacity as well. To guarantee high data accessibility for life-critical healthcare applications, healthcare organizations are challenged with implementing compliant storage solutions that include more capacity, better resiliency and faster performance. For real-time, always on hospital data access, embracing software-defined storage in a HA configuration across diverse storage systems ensures for maximum availability, functionality and efficiency of all storage resources at all times. 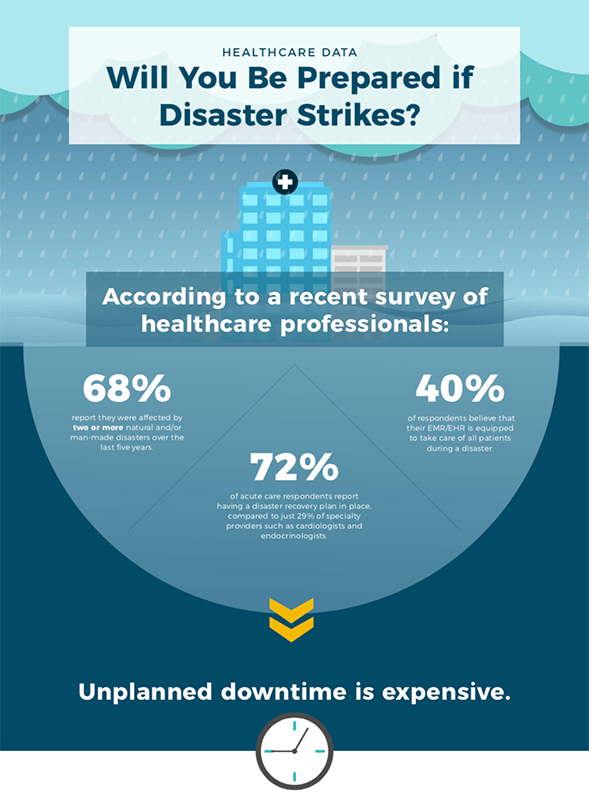 DataCore’s software-defined storage platform offers hospitals the possibility to reduce disruptions and achieve zero downtime, with zero RPO and zero RTO with various deployment models for business continuity and high availability including mirroring and replication. DataCore’s platform is scalable—hospitals purchase just once and use it forever. Even if hardware changes, DataCore simplifies adopting new technology seamlessly, such as NVMe, and eliminates the manual work required to migrate data. DataCore’s platform enables a hospitals with the fastest response time, by using patented technology that reduces bottlenecks and parallelizes I/O, resulting in significant performance improvements for existing systems, and maximum throughput for newer ones. Learn how Maimonides Medical Center is working with DataCore to ensure high accessibility to data in real time. While hospital and health system mergers and acquisitions can generate positive healthcare benefits—including reduced costs, increased conveniences and improved outcomes—IT management teams struggle with issues related to managing and consolidating data from previously disparate legacy systems and maximizing the value and life span of existing investments. DataCore’s software-defined storage solution provides a virtualized pool that abstracts storage infrastructure from disparate vendors and technologies into one common set of enterprise-wide services with one management interface. Following a merger or acquisition, the vendor-agnostic DataCore platform gathers a hospital system’s collective resources, managing them centrally and uniformly despite potential differences. This includes incompatibilities among manufacturers, legacy models and generations of equipment in use. Dynamic auto-tiering at the sub-LUN level ensures the applications that require faster performance always have access to the faster hardware, without the need for migrations or human intervention. Healthcare organizations face the ongoing threat of ransomware attacks or other unexpected catastrophic events that can make it almost impossible for clinicians to access the data necessary to treat patients in need. In today’s reality, it’s not a question of if a data protection solution makes sense for a hospital or health system but rather when that need will arise and how quickly they can be up and running again. Every vendor promises real-time, always-on hospital data access, but it’s not a checkbox item. For starters, there are important differences between data protection architectures and technologies. Hospitals need to consider which one is easier to implement and how much flexibility is offered with each approach. What manual intervention is required to fail-over and what is the impact to care teams and potentially life-saving applications? How simple is the fail-back to primary systems and restoring the system to the state before an incident? Zero-touch, zero downtime means that your hospital data is always available. There is no need for manual processes to restore data from a backup copy or a disaster recovery site. Storage failures are handled automatically, without any downtime, as is failback. DataCore’s synchronous mirroring capability enable virtually zero RTO and zero RPO. For disaster recoveries, asynchronous replication scheme assures another copy of the hospital’s data is available hundreds of miles away. To protect against Ransomware or other attacks, Continuous Data Protection works like a time machine, giving your team the ability to restore to any point in time, seconds before an attack, minimizing business impact. Skyrocketing storage costs are eating away at already lean hospital IT budgets that are challenged by the move to value-based care. As healthcare organizations continue to expand their infrastructure to accommodate new digital technologies, the volume of data collected and stored is expected to continue to increase accordingly. How do hospital CIOs and their teams meet increasing performance demands without resorting to ripping and replacing existing infrastructures? By providing a virtual storage pool that abstracts storage from different vendors’ systems and dynamically assigns workloads to optimal storage tiers based on performance requirements, DataCore enables hospitals to scale up or scale out applications while efficiently using all available resources. DataCore allows for the unified management of heterogeneous storage systems, which greatly improves productivity. New storage requests can be provisioned from a software console, removing the need to manage and plan capacity at the array level. Once you have DataCore’s SDS solution in place, your team won’t have to spend time migrating data when a new array is added or when and old one is decommissioned. The system will optimize applications dynamically to make use of the best performing storage available automatically. Thin provisioning and other patented technologies improve the efficiency of storage systems, resulting in the dramatic reduction in investment requirements. With DataCore, lower-cost storage arrays can be deployed efficiently, delivering performance and data services that may be comparable to much more expensive systems. Learn how DataCore can help your team address your healthcare organization’s most pressing storage challenges and how we deliver on our technical promises. DataCore’s software-defined storage solution provides hospitals with uninterrupted data access, massive architectural scale-out and game-changing application performance. 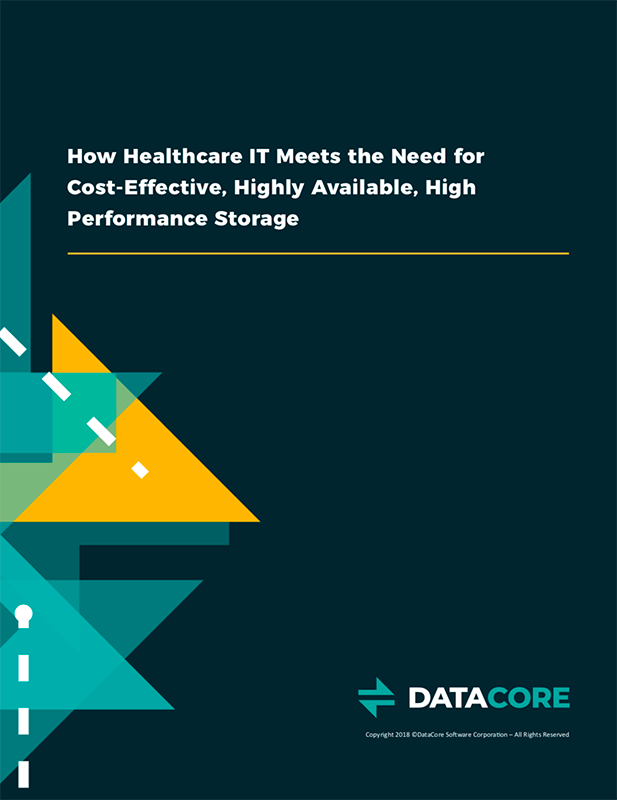 DataCore’s software-defined storage helps healthcare organizations address these challenges by forming a transparent virtualization layer across diverse storage systems to maximize the availability, scalability and performance of all storage resources. DataCore’s hyperconverged storage solution allows hospitals to seamlessly consolidate their virtualized infrastructure. Talk with a solution architect to learn how to improve the economics, availability, and responsiveness of your mission-critical healthcare systems.